You know those flower pots that you use in your garden? Well, they also make a fantastic addition to your aquarium! Today, I am going to show you the different ways to use terra cotta pots to enhance your aquarium – including how to make sure the pot you use is safe! How do you prepare clay pots? Some pots are dangerous to your aquarium. The pots to use are called clay or terra cotta pots – a flower pot that is made of clay and hardened by heat. And, you want it to be naked. What I mean is that you want to avoid any pot that has been glazed, painted or dyed. Glaze and paint can contain harmful chemicals that could leach into your aquarium. And, you don’t want that! You can easily identify a terra cotta pot by its reddish, brown color – the color the clay turns when heated in a kiln. And as always, new is best! Old terra cotta pots from your garden have been exposed to fertilizer, weed killers, bug spray and other chemicals. That’s some nasty stuff you don’t want in your aquarium, right? 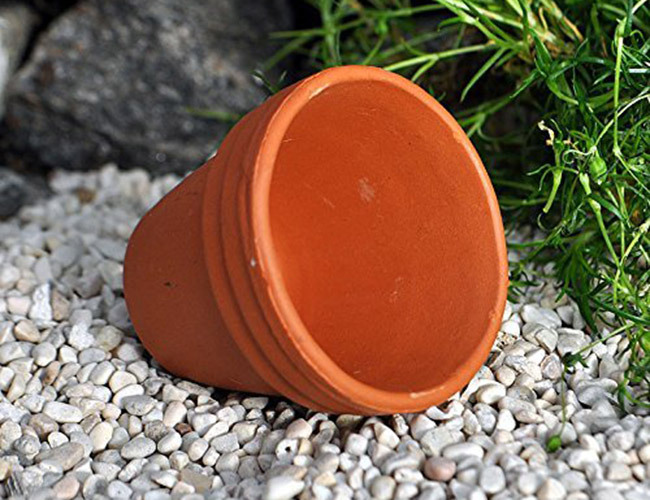 Don’t forget, clay flower pots come in different sizes and shapes – choose the right size for your aquarium. You can find them at your local nursery, hardware store or even online! Preparing the pot is simple. First, peel off any stickers and adhesive. If you can’t remove all of the sticker, I recommend using a piece of sand paper to buff it off. Now, you have the option to break the pot into smaller pieces. Breaking your pot into halves, shards or just knocking out the bottom allows you to create a unique aquarium that looks amazing. Don’t worry, this doesn’t mean your pot has dye added to it! The piece of terra cotta above is perfectly safe for your fish. You see, the clay used in terra cotta pots starts out as a gray color. When it is heated in a kiln, it turns into the red/brown color that we associate with terra cotta. Because the middle layers of the pot don’t receive as much heat as the outer layers, the inside of the pot may be closer to the original color than the outside. Next, run your fingers around the pot to find any sharp edges. If you come across any, sand them down until they are smooth – you don’t want your fish catching their fin on any pointy bits. Finally, rinse the clay pot under hot water to remove any clay dust that is clinging to the surface. Don’t use any soaps or detergents. Because clay pots are porous, any soap is absorbed, only to be released into your aquarium. And, you don’t want that! It’s not unusual to see the surface of the clay pot bubble when you insert it into your aquarium. This is the air escaping from inside the clay pot – it’s harmless. If you are not feeling brown, you could always use an aquarium safe paint to brighten up your terra cotta pots. Do something about any drainage holes at the bottom of the pot! You see, it’s not uncommon for fish to attempt to swim through these drainage holes and get stuck. In fact, there are horror stories all over the web of how a hobbyist’s beloved fish got stuck in the hole of a clay pot and died. Fortunately, his owner rescued him, but the situation could have been very bad! Not exactly something you want to come home to, right? So, do yourself a favor. If you plan to use clay pots in your aquarium, remove the entire bottom of the base. Alternatively use an aquarium-safe glue to plug the holes with rocks or seal them with silicone (make sure that it’s an aquarium safe silicon.) Your fish will thank you! But when prepared properly, clay pots are perfectly safe to use in your aquarium. Sure, they may take a bit of time to prepare, but the results are worth it! The main advantage of creating a planted tank with clay pots is that you can easily move them around as you see fit. Don’t like the current plant arrangement of your tank? Move the pots around. Want to swap one plant out for another? Just remove that pot from your aquarium. Simply fill your clay pot up with your preferred substrate, soil, gravel or sand, and insert whatever rooted plant you want. Don’t forgot the root tabs! Plus, maintenance is a breeze since you can remove each of your plants from the aquarium without pulling at the roots of your plant – easily clean your entire tank without plants getting in your way! Using clay pots is particularly popular in bare-bottomed aquariums, meaning no substrate. 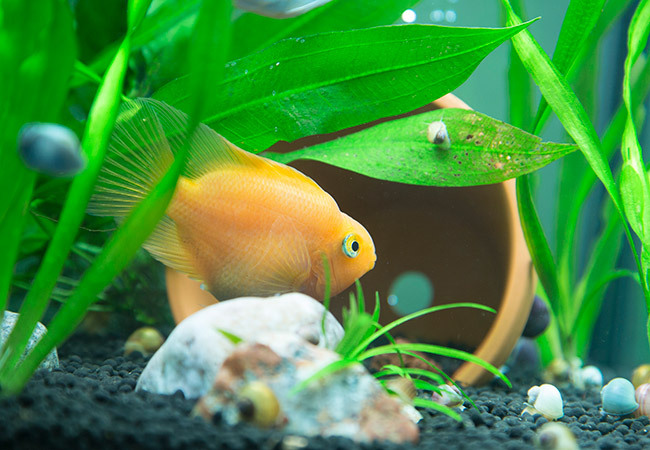 Do you have a shy fish that loves to hide from view? Well, a carefully positioned clay pot can allow your fish to feel hidden while still allowing you a great view. 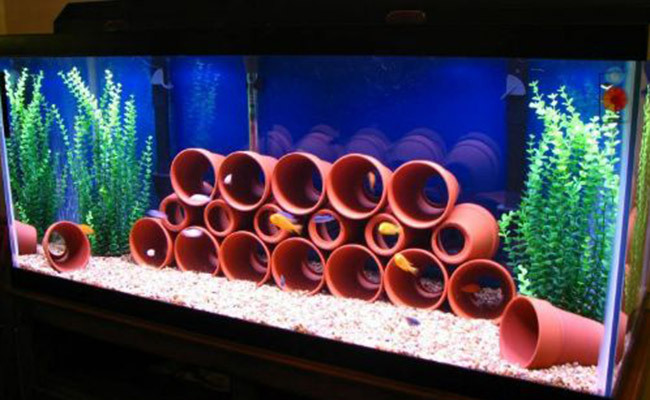 …Allowing you to be creative with how you place pots around your aquarium. If you break out the bottom, you can even use a clay pot as a tunnel for your fish. Just make sure you choose the right-sized pot for your fish. If your fish is too big for the cave or tunnel, your clay pot is just going to become an unused aquarium decoration. 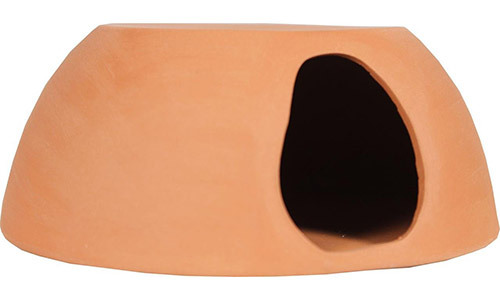 If you like the idea of using clay pots as fish homes, but don’t want to make your own, why not use a ready-made terra cotta fish cave? Me, personally – I prefer to go the DIY route and break a clay pot into pieces. It gives you more options to customize the cave to the size and shape of the fish in your aquarium. Have a fish you want to breed? 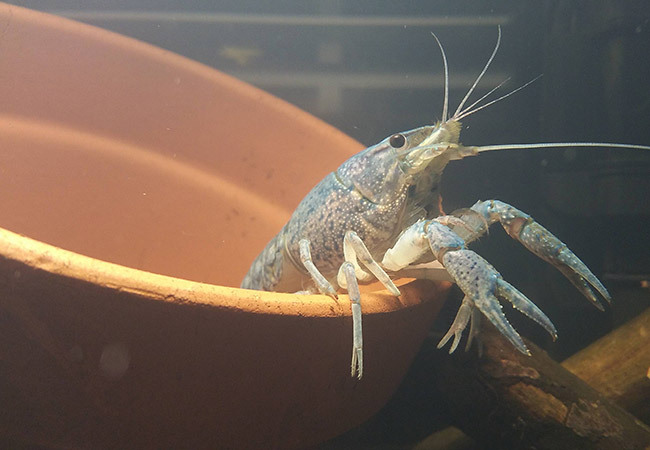 Adding a clay pot to your aquarium could be the equivalent of playing Barry White through your speakers and dimming the lights – if you know what I mean. You see, fish like clownfish and cichlids lay their eggs in “breeding caves” – and as you might have guessed, a clay pot is perfect for this purpose. 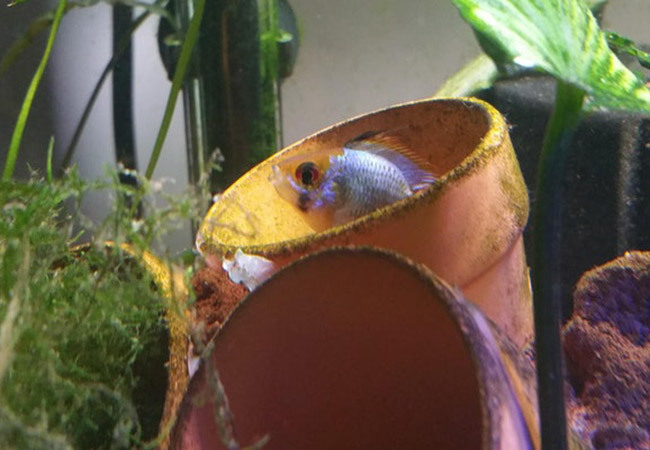 Sinking food pellets are great and all, but if you have a messy eater, they can end up scattered across your entire tank, with many going uneaten. And as you are no doubt aware, uneaten fish food is a major cause of water quality problems. A small clay pot can be used to keep sinking pellets in a single location, with your messy eaters climbing or swimming into the pot to eat. Once feeding time is over, simply lift the clay pot out of your aquarium and remove any uneaten fish food. 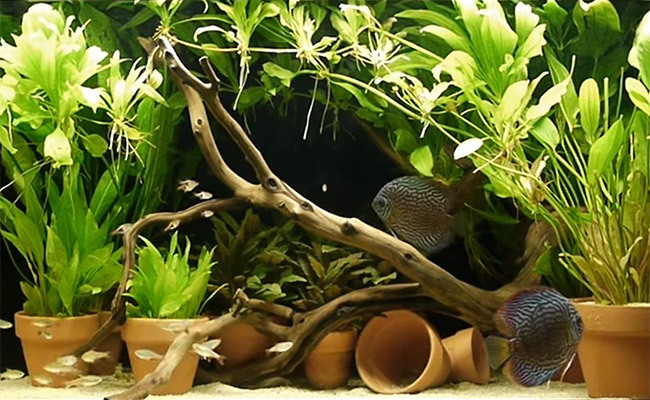 For those of you who want cheap aquarium decorations, a bunch of clay pots, paired with a few plants and contrasting substrate, can actually look spectacular. By positioning terra cotta around your tank, you can create an environment that your fish will love! As you see, terra cotta pots are an affordable and versatile way to add character to your aquarium. The beautiful thing about adding terra cotta pots to your aquarium is that there is no single best way to do it. Whether you use a single clay pot in the corner of your tank or create an entire terra cotta city – the only limit is your imagination. So, grab a clay pot and start experimenting today! 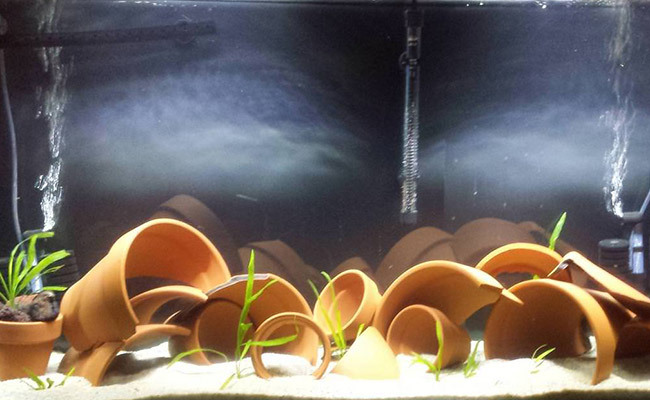 What do you think about using terra cotta pots in your aquarium? Let me know in the comments below! I’m new to fishcare. I rescued a betta from a tiny cup and now he’s my pretty boy. I originally had him in a 1 gallon Mason Jar and when I first put him in it he flipped out! He was so happy. But I wasn’t happy with the small tank and bought a 3 gallon acrylic tank with filter and LED light. I let him adjust then I added a moss ball. He pushes it back and forth in the tank. This little guy is amazing. I never imagined that he would interact with me the way he does. I named him Samari Jack and I talk to him through out the day. I want him to be happy and I have been searching for a tank ornament that is also a hideaway. I haven’t been happy with anything I have found in the store and I am so glad to find out that Terra Cotta pots are safe. I already have the perfect thing. My tank is round and a lot of stuff doesn’t fit in the circumference. Thanks for your help! 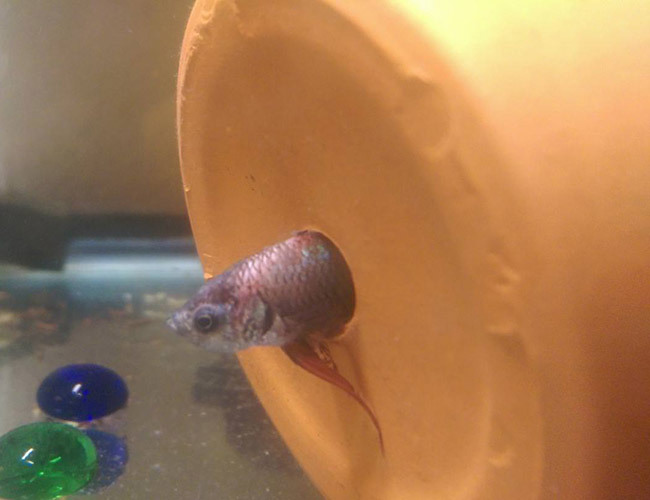 Firstly, well done for upgrading your bettas home. A 1 gallon mason jar is indeed too small for a betta. In order for them to really shine and share their personality with you, they need a larger tank. Samurai Jack is an awesome name – my nephew loved that show when he was younger. You are correct in that square tanks are much easier to decorate than round ones, I’m glad to hear you have found a solution with terracotta pots! I am in the middle of setting up my very first aquarium. Today I have added the plants. The customer advise give to me, was to just leave these plants in the plastic pots. As you probably can imagine it looks rather bad. For ideas I reached out to the www and come across your little tips how to incoporate terracotta pots. Such a cute idea but my aquariums decor is grey, white and dark grey and the orange terracotta colour would just clash. I have found some very cute grey coloured pots but am worried that they are chemically treated eventhough they look very natural. Is there anyway of knowing? Unfortunately, there is no easy way of knowing what is in the pots for sure, they are usually manufactured overseas where quality control can be hit and miss. I live by the motto: When in doubt don’t add it to your tank. I don’t think this is an issue at all. I have personally brought terra cotta pots to a slow-boil in the past for this very reason, I was concerned they were contaminated. Is there anything aquarium safe that the pots can be covered in so not looking at the ugly red color. I have a bunch of small pots in with my juvenile African cichlids, but will be needing bigger pots soon. Their versatility is unmatched, I just hate the unnatural look. You could paint them then coat them in a clear 2 part epoxy. However, this process is quite time consuming, fiddly, and you need to make sure they are completely sealed, otherwise you risk paint leaching into your aquarium. Otherwise, you could try hiding them by using plants and decorations? I have seen some “chocolate terracotta pots”. Do you have any experience with these. I can’t see why they would be a problem as they are not painted. I’m guessing the colour is something to do with the type of clay used or the firing process. I have seen cichlids hides that are dark grey/white so assume that different coloured clay would be ok to use? As a lot of pots are manufactured over seas, where regulations and materials are different, I cannot comment on the safety of a particular type of pot.If you have noticed no adverse reactions and your water parameters are normal then that all sounds positive. I read the aquarium pots with plants should have an opening on the bottom to help the roots. You advise sealing the bottom hole with aquarium silicon. Your thoughts, please. As per the article, this advice is for using pots as caves, so fish don’t get stuck. If you place a pot in a normal orientation, and fill it with soil, a fish can’t swim through the drainage hole. We have just put Terracotta pots in our aquarium and now the water is a yellow colour. There is nothing else in the aquarium that would have caused that and we are wondering if it will be harmful to the fish? Do you have driftwood or any other pieces of wood or dried plant matter in your tank? If yes, then you should know that these release tannins, which yellows up the water. Tannins are natural and often beneficial, especially if they are found in your fishes natural habitat. Many people add indian almond leaves to their betta tanks for their tannins. If it’s your pots, then that’s not expected and is cause for concern. I have never experienced terracotta pots turning water yellow. 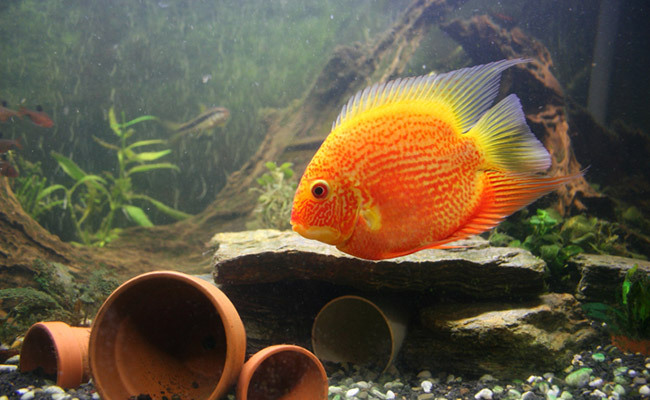 Many discus owners use terracotta pots in bare bottomed tanks, with little else in them, and their water remains crystal clear. Hi, I put in a small terracotta pot in my aquarium, I have black sand in my aquarium, the next morning I noticed some rust colored stuff on some of my sand, I guess it’s the same color of the terracotta pot. Is this normal? For some of the pot to come off and be on the substrate? I did rinse it before hand. Depending on the quality of the terra cotta pot, it is possible. Normally this doesn’t happen until the terra cotta pot has been submerged for quite some time. I’m surprised you have seen it happen after just a single day, especially after a good rinse. If it continues to break down, I would remove it from your aquarium. I’d be surprised if the pots were the cause of your low pH. The first thing you should do is test your tap water pH and KH before adding it to your aquarium, to determine that it is actually something in your tank responsible for the low pH and not the tap water itself. Great questions. Next time I do a terra cotta aquascape, I’ll add some pictures to this guide. I usually either use a hammer if I want random broken bits or a dremel with a diamond cutting wheel if I want something more control over the shape. To smooth those edges, either a dremel sanding tool or some old fashioned sand paper will do the trick. I assume you mean creating a hole in the side of the pot? 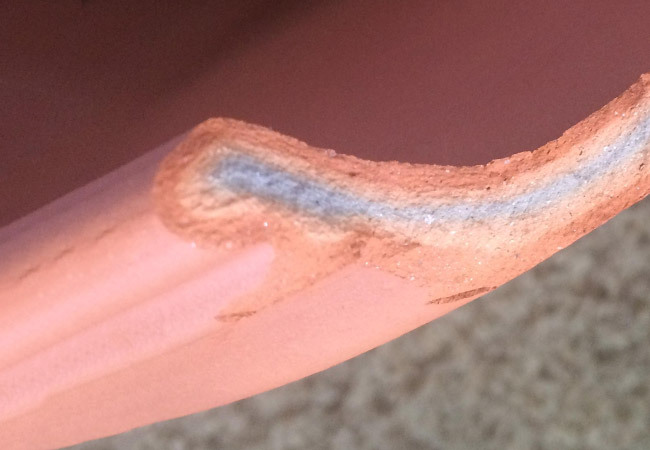 As long as it’s a thin walled terracotta pot, a dremel with a diamond cutting disk is more than up to the task. Best of all, it’s something you will likely find a use for in the future, unlike a tile cutter. Don’t forget to file down all edges, so that there are no sharp pieces left – you don’t want your fish catching their fins! Thank you so much for you straight forward information. After 18 years I am redesigning/refurnishing my koi pond, have a gutter downspout in the correct location and want to have the gutter empty into the pond. Research has ruled out the possibility of any kind of metal rain chain, but your site has given me the idea of creating one out of vynal and clay pots. Should work wonderfully and I’m very exited about being able to include this feature in my pond set up. Again thanks so much. That sounds like a very creative use of clay pots. I would love to see a photo of it when you are done! If your pots are not stable, you can certainly glue them together. If you do go down this route, check out our guide on aquarium safe glue. 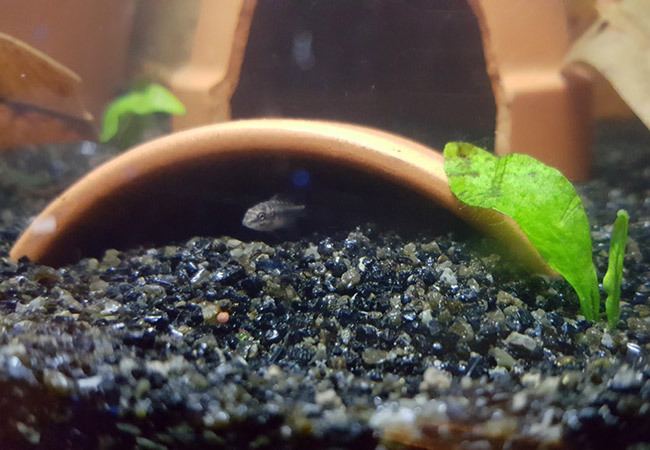 I purchased a clay pot from the fish store and after 2-3 months of it being in the freshwater tank, i noticed the top half is slowly staining (like mold on a wall). Is that a good thing or bad thing? I don’t have any real plants in the tank so I don’t think it’s algae since the rest of the tank is pretty clean. I do a partial water change every week cause it’s a smaller tank. Great question! This slow staining could be anything – bacteria, biofilm, algae etc. If you have used an aquarium test kit, and your water parameters seem normal, then it’s probably nothing to worry about. Pots just get “dirty” over time. If you scroll through some of the pictures you’ll see that some of the terracotta pots from more established tanks have light brown or green discolorations. If it really bothers you, you could try cleaning your pot in a mild ammonia solution before rinsing it with freshwater. However, it’s highly likely that this discoloration will still come back. I just bought some water plants with the idea of making a very small water garden – no fish just plants. I’m frustrated trying to find a way to put the plastic pots back in the water without a lot of soil leaking out. How does this sound like it would work? ?… plug up bottom drainage hole of a terra cotta pot just by laying a piece of coffee filter or thin foam air filter type of material, and then go ahead, repot, and then submerge the whole deal in the water up to the appropriate level for the plant? Unfortunately, I am unfamiliar with water gardens. However, in an aquarium you would just seal these holes up with silicone. Since these holes are just for drainage, and the whole pot is submerged, they don’t really serve a purpose. Now you also want to stop the water from floating out the top. In aquariums, a capping is added. A capping simply refers to using another material to seal the soil in (in aquariums 2-3 inches of soil is typically used). Most aquariums use either a thick layer of gravel or sand to cap the soil. This way your plants are getting the nutrients they need without the soil leaching into the water. Most terracotta pots after weeks underwater become soggy, brittle and breakup on touch. Interesting observation. 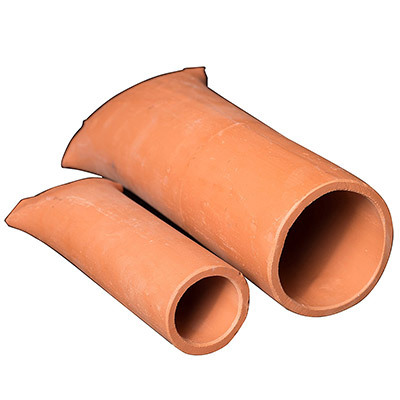 Are you sure the pots you are using in your aquarium terra cotta? I only ask because terra cotta is commonly used in aquarium products like pleco caves and cichlid breeding huts. Air dried clay pots on the other hand will quickly reabsorb water, turning back into soft clay when placed into your aquarium. 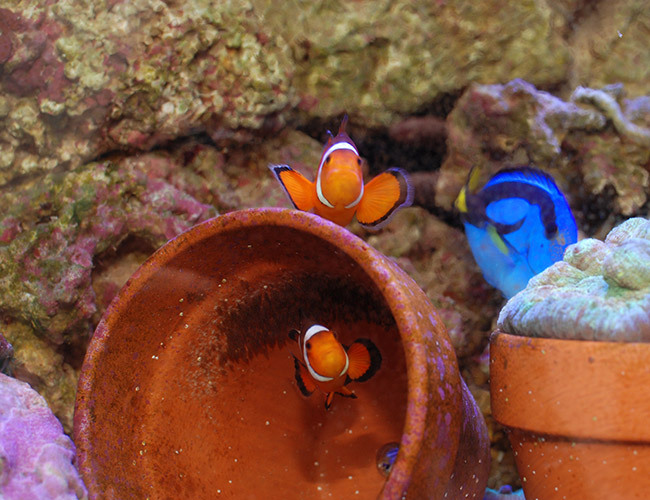 Kiln fired clay pots (terra cotta) are typically considered aquarium safe by hobbyists. As always, fishkeeping is an ever evolving hobby and if you can provide evidence to the contrary then I would love to know more! What kind of setup would you suggest for a 10 gallon tank? I really like the look of the terracotta pots and they are inexpensive. Great question. When it comes to terracotta pots, avoid anything that has been painted, dyed or glazed. The problem with painted terra cotta pots is that they can leach harmful chemicals into your aquarium. If you stick to the plain orange pots, your Discus will thank you for it!